Designing and then creating a new website can be a daunting prospect. The number of technologies that have to be mastered can be time consuming and expensive. But what if your business could create a cutting-edge website by doing nothing more than filling in a few online forms? This is possible thanks to CMS or content management systems that are now widely used by businesses to create online content. One of the biggest CMS in terms of sites created and usage is WordPress, an open source based CMS platform that has moved from being just a blogging platform, to a fully featured, easy to use, powerful, and flexible content management system used by over 55 million sites worldwide. Your business may already use WordPress to maintain a blog, but WordPress has matured to the point where it can be used to create standalone websites as well, and if you're comfortable updating your business' blog, you can use WordPress to create a new website for your enterprise. What's more, the new buzzword in website creation is responsive design. As more of your business' customers will view your website on mobile devices such as tablets and smart phones, websites must adjust themselves accordingly. WordPress itself is free, as it is an open source project. Themes now exist to take full advantage of responsive web design. Widgets can be easily included on a page to add a plethora of functionality to a website. Plugins are available (over 21,000 currently) that can add functions to a website in seconds. A WordPress-based websites can be redesigned by simply changing the theme that is being used. A WordPress site can be hosted on your company's existing web space saving time and money. Specific modifications can be made to any WordPress theme by anyone that understands the PHP programming language. WordPress is constantly upgraded to ensure its technology reflects current developments in web design. One of the most powerful aspects of using WordPress to design your business' website is the instant feedback you receive. You can make a change to the theme you are using and see how this will look on a test version of your site. Content can also be developed and then scheduled to be released over time to keep your site looking fresh. It is important to appreciate that WordPress builds the pages you have created for your website from a database of components. Just as images, video etc. that you may have on your business' blog, when you use WordPress for a website the same principle applies with all page elements held on a database that you will have to host. WordPress is constantly being upgraded by its developers, which can mean that when your business upgrades the version of WordPress it is using, some widgets or plugins may stop working. The hosting of the database that powers the new website must be robust and reliable. Consider a dedicated server if your business doesn't already use one to ensure that disruptions and downtime are minimised. When your business is thinking about its data backup options, don't forget your website. WordPress may also be your blogging platform, but when used as your enterprises main website system, backing up your WordPress files is vital. Always test a new theme on a test version of your site. New themes may not have placeholders for the content your site currently displays. Some tweaking of the PHP code that each page is constructed with may be needed to get the new theme working as you expect. 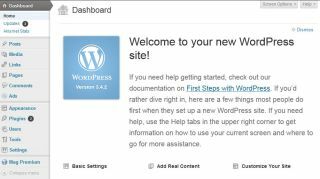 Using WordPress as a CMS can mean that multiple users can update content on your site with ease. Ensure your business has a clear policy about these updates to avoid security issues. WordPress' user interface is a key strength of the platform. The ability to change a page by just clicking a few buttons, or choosing the correct option, makes WordPress a superb CMS especially for smaller enterprises. The power of using WordPress as a CMS is the ability to extend and expand WordPress to deliver precisely the website your business needs. WordPress when used as a CMS has attracted the interest of developers that have created add-ons to expand the CMS capabilities of WordPress. Advanced Custom Fields allows users to customise WordPress edit screens. The number of plugins that are now available can seem bewildering. The best way to approach your choice of plugin is to have a clear design goal for each page. Once you know what each page of your website needs to contain, you can search for the most appropriate plugin. Tools like Visual Composer enable you to take a basic page on your website and create unique content without the need to know any programming languages or have any design skills. WordPress is clearly much more than a blogging platform. Sophisticated responsive websites can now be created with its tools. A major component of those tools is the ability to take content from a wide variety of other sources and seamlessly incorporate these into your website's pages. For fast and efficient website construction WordPress when used as a CMS is hard to beat. There are few up front costs, and with an almost infinite variety of themes, plugins and add-ons to choose from, you can build, maintain and expand your business' website with ease.